Seamen’s Church Institute is excited to announce the grand opening of The Discovery Deck, its new interactive, educational exhibit showcasing the maritime industry of Newport and Narragansett Bay. The ribbon-cutting ceremony will take place during the Institute's Annual Meeting on November 12th from 6:00 p.m. -8:00 p.m.
All are invited to join us for an evening of reflection and celebration, as we look towards the future and prepare for our 100th year of serving the community. 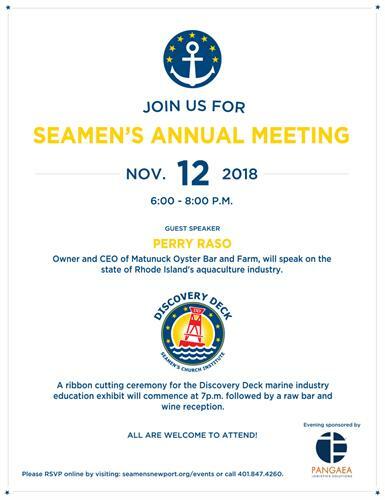 The evening will kick off with an open Board meeting at 6pm followed by guest speaker, Perry Raso, Founder and CEO of Matunuck Oyster Bar and Farm. Seating is limited for this portion of the evening. Please RSVP by visiting: https://seamensnewport.org/events/. The ribbon-cutting ceremony for the Discovery Deck takes place at 7 p.m. with refreshments and reception to follow.